The reader is able to see how the orders were written and the style that was used. Marshal, the Emperor orders, that you would convey your headquarters, during the day of the 7th, to Lichtenfels. Your first division will be encamped around this town, your two others between Bamberg and Lichtenfels, in a manner that tomorrow, the 9th, all your army corps can be reunited, in a war march [reference to a particular arrangement of formations? ], before Kronach, and be in (some) measure of supporting Marshal Bernadotte who must, during the day of the 9th, moves on the Saale. I inform you that the right of the army, departing from Amberg, will occupy Bayreuth the 7th and will be at Hof the 9th. It [the right wing] is composed of the corps of Marshals Soult and Ney. The left, departing Schweinfurth, debouches on Cobourg and from there, by Grafenthal; it is composed of Marshals Lannes and Augereau. The headquarters is at Bamberg. It will be the 8th at Lichtenfels, the 9th at Kronach"
Marshal Davout is ordered to depart with all of his army corps from the position that he occupied in order to direct himself directly on Naumberg where he will arrive as fast as he is can, in holding always however his troops ready for combat; he have all of his light cavalry precede him who will send some scouts [also translated as "skirmisher" in Cassell's, but not as courier; alternatively translated as "runner" -- which could carry a sense of a courier, I suppose] as far as possible, as much in order to have some news of the enemy as in order to take some prisoners, halt the baggage and have some precise information. 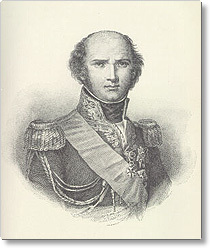 The division of dragoons of General Sahuc will be under the order of Marshal Davout: I anticipate that I have General Suhac told to place himself at Mittel where he will take orders from Marshal Davout. The Grand-Duke of Berg and Marshal Bernadotte equally have the order to place themselves at Naumberg, but to follow the route from Zeitz. Marshal Augereau positions himself at Kahla; Marshal Soult at Gera; Marshal Ney at Mittel. The imperial headquarters will be at Gera at noon today." "General, the Emperor orders that you be at the command of Marshal Davout; this marshal is before you at Mittel; General Sahuc will be sending to take his orders, his division being destined to march with his army corps. I am informing the Grand-Duke of Berg of this. Place yourself on the field with your division at Mittel." I have the honor to render an account to Your Highness that the light cavalry has entered Naumburg at three-thirty [in the morning? ]; the advance-guard arrived there at eight o'clock in the evening; the day having been extremely difficult and having occasioned a lot of straggling, I have had the 1st Division halted at a place just short of Naumburg, the 2nd a little bit farther and the 3rd at about three leagues. The division of dragoons of General Sahuc has been placed at the same point as the 2nd Division; tomorrow, at seven o'clock in the morning, all the army will be gathered here. General Vialannes seized several wagons of bread and of baggage; but a more important seizure is that of twelve coppered pontoons perfectly harnessed; this last prize was made between Naumburg and Freyburg; I had them preserved, as well as the [teams in] harness, in order to hold them for your disposition, having promised to the 1st Chasseurs Regiment to have them paid for all of the horses in conformance with regulations. We give notice [best I can do with this phrase!] here of large magazines of forage and grain; I will have made an inventory that I will have the honor of presenting to Your Highness. Some reconnaissances have been sent [in] from the direction of Jena, but they have still not returned [I'm not sure of the coherence of this: perhaps he is saying that patrols were sent out but haven't come back in yet]; some cannon fire has been heard from this side; I have not yet had news on this particular from the Prince of Ponte-Corvo. All the reports from deserters, from prisoners and the people of the country, agree in indicating that the Prussian army is located at Erfurt, Weimar and the environs. It is certain that the King has arrived yesterday at Weimar; they assert that there are no troops between Leipzig and Naumburg. I have had all of the packets seized from the mails; I present them to Your Majesty; may be something interesting will be found there. They manifest still a lot of boasting in the Prussian officer Corps. An unsigned letter addressed to the Prince of Saxe-Coburg compares the defeat at Saalfeld to that of the Austrians before Ulm, for the despondency it has spread widely in the army. Yesterday and today about two hundred deserters have passed this town. I send a detachment to carry this dispatch to Your Highness; tomorrow morning, as soon as I have obtained new information, I will have the honor to present it to Your Highness. P.S. I seems constantly to me that the Prussian troops are uniting in the direction of Weimar. This campaign promises to be still more miraculous than that of Marengo and Ulm." Orders to Marshal Davout from the Imperial Headquarters, in bivouac, a league and a half from Jena, 13 October 1806, 3:00 p.m.
"Marshal, the Emperor learns at one league from Jena that the enemy is in the presence of Marshal Lannes with about 50,000 men. The marshal even believes that he will be attacked this evening: if you hear an attack this evening on Jena, you must maneuver on the enemy and overwhelm his left. If there is no attack this evening at Jena, you will receive tonight the dispositions of the Emperor for the day ["journee" carries a sense of focus on the day itself, or on its length] of tomorrow."